She has a great attitude towards it all, doesn't she? And there's Carol sitting beside Susan in the flying needle action shot. 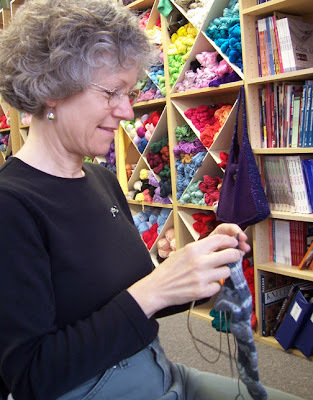 She's knitting that mitered top from the latest Knitter's Magazine, Tie-dyed Boxes. 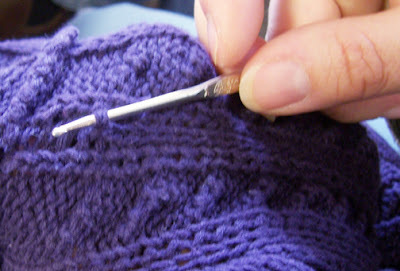 It has a really interesting construction, and I love the yarn she's using. She's also wearing this gorgeous soft and fuzzy sweater she knitted. And she let me fondle her sleeve. Yum! And so is Therese, who has a great new haircut that I unfortunately cut out of the picture (oops). 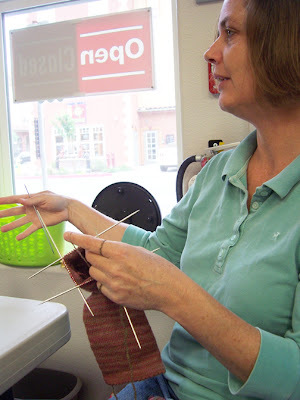 While we were comparing Susan's favorite purple sweater to the sweater she is knitting, she discovered a run. So I set about to fix it. 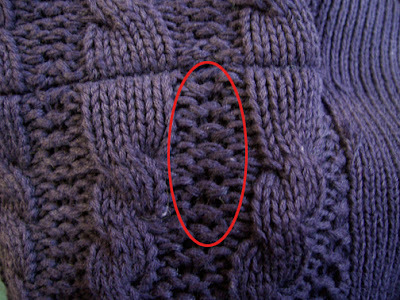 The sweater is machine knit of cotton and employs an interesting slipped stitch pattern between cables that I assume is designed to make it stretch less in length. It's a cool idea! I think I will try it on my next cotton sweater. 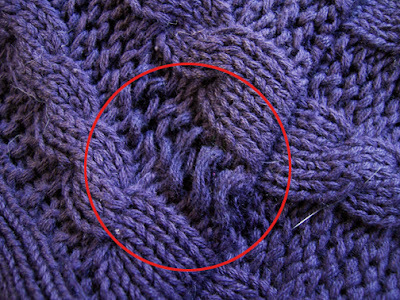 And the mended area after I darned in the stitch along the seam. 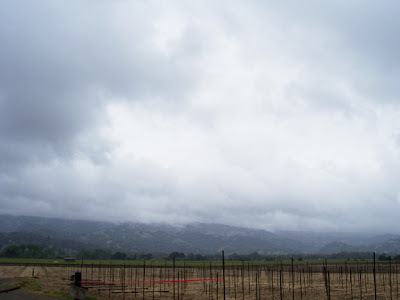 Here's the sky today, looking out over a brand new vineyard that hasn't yet been planted. Like I said, it's grey. Great looking "fix!" Could you elaborate more on the slipped st and the cables?? Now, this is definitely the perfect fix - looks fantastic indeed! 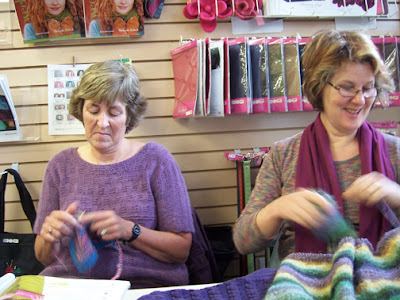 What a wonderful time it seems you ladies are having - it's just the best to get together with like-minded girls and do a bit of knitting and chatting together, isn't it? Hello there, I am a Windsor resident and enjoyed seeing some local home news. Yeah! !